Bidston is an island station, situated well away from the nearest houses, surrounded by marshland, with the M53 just to the west of it. There is a three-minute turnaround for our train, as it battles to offload its passengers from Wrexham, before those going south get on. It leaves from platform 2, which is where trains go to West Kirby from. The train leaves the West Kirby line straight away and moves southwestwards, running parallel to the M53 motorway, which is on the right. We start to see houses on the left and horses in a field on the right. We speed up to about 40 mph on unwelded track, going for about a mile, until we stop at Upton station. It has two vile green metal shelters, but is surprisingly free of graffiti, though the whole station looks rundown, with one of the station signs rusty and bent. Wild grass is growing on the platforms. Then we go into a low cutting before the M53 appears again and there is newish housing on the left. We then start to climb up onto an embankment, as we pass houses on both sides below us. We then go under the M53 and out into the countryside. We go into a low cutting and there is welded rail beneath us for a couple of miles, with open fields on both sides. Housing appears on the right as we go onto an embankment and then stop at Heswall station. It used to be called Heswall Hills, but was renamed Heswall in the 1980s. The station has two turquoise and cream glass shelters on its newish looking platforms, which are built on stilts. Whilst there is no graffiti on the station, the track has plenty of weeds growing from it. We then go into a low cutting, which I notice is flooded in parts. We go under the A 540, then the line curves to the right and the left before we see fields again. On the right there is a nice view across the Dee Estuary to the mountains of North Wales. We move onto an embankment again, as houses start to appear on both sides and then we come to a halt at Neston station. It has two perspex shelters, which sadly have been graffitied, though they do have some tubs with colourful flowers in them. The platforms are also quite new and are standing on stilts. We stay on the embankment as we speed up to about 50 mph, passing houses on both sides, before we enter the countryside again. We then go into a cutting, before we pass the remains of Burton station, where parts of the platform are still in place. Then it's into a deep sandstone cutting, which marks the border of England and Wales, before we emerge to see the landmark of the former Shotton steel works on the right ahead. Two tracks of sidings appear on the right and a new road bridge can be seen ahead. There are several greenhouses on the left and then we go under the A55 as some lines go off to the Shotton Paper Company complex. There are warehouses on the left and we go past Deeside Titanium on the right and an oil depot on the left. There are more sidings on the right with VTG wagons in them. Then we slow for Dee Marsh Junction, where 66094 is at the head of a train of Tiphook Rail wagons. Then the line curves to the right and you see the remains of more track, as we pass Dee Marsh Junction signal box, which is still very much in use. We pass through Hawarden Bridge Station, but don't stop (as the station is only used in morning and evening rush hours) and then cross the river Dee on a cantilever iron bridge and then arrive at Shotton station. There is also another part to the station, which is below us on the North Wales main line, which we have just crossed over. There is a perspex shelter on the left and a red brick station building and shelter on the right. They look like they were built in the 1960's and are rather neglected now. About twenty passengers are waiting on the other platform for the 13.00 train to Bidston. As we leave we go over the main street for Shotton, and then onto an embankment with houses on either side. We then pass some bushes and we are now out into the Welsh countryside, which is more hilly from where we have come from. We pass a wood on the right and then enter a cutting as we start to climb uphill. On the left is a lovely view to Chester and across the Cheshire Plain. We go into another cutting and then come to a stop at Hawarden station. It still has its original cast iron footbridge, as well as two turquoise and cream shelters, with hanging baskets in them. We go past a golf course next, which is on both sides of the track and then pass fields of wheat. We enter another cutting and go under the A55 at about 40 mph. Next up is Buckley station, which is on a sharp bend. It has another of those vile green shelters on the right platform and a nicer brick shelter on the left platform. We go back out into fields again, and then pass a large industrial building on the right of Penyffordd Cement works, with a line and sidings going to it. We then pass the remains of another station - Hope Exchange and then slow for Penyffordd station. It has a brick shelter on the left, free of graffiti, and a perspex shelter on the right, covered in graffiti. The station signs look all mouldy, giving the impression of a run down station. We pass through more fields again with the hills on the right getting higher. We pass fields full of sweet corn on the left and then stop at Hope station. It has a green shelter, covered in graffiti and has been rebuilt in recent years. We continue to move upwards again, with houses on both sides and then go onto an embankment and stop at Caergwrle. It has a lime green and cream perspex shelter on the right and a nice original brick shelter in cream and blue on the left. We climb again and go onto another embankment, passing through woodland here. We don't go too far before we stop at Cefn-y-Bedd, which has nice cream and blue brick shelters on both platforms, without any graffiti in them. We go onto a viaduct and then an embankment, passing Hope Mountain on the right. After going through a cutting with lots of vegetation in it, we emerge to yet more views across the Cheshire Plain to Bickerton Hills. The A 541 runs near us on the left and then we go under it and slow as houses appear on both sides and we arrive at Gwersyllt station. It has a blue brick shelter on the right and nothing on the left hand platform. We pass through a cutting and then see newly built houses on the right. Then fields appear again with sheep grazing in them. We pass underneath the A541 and then the outskirts of Wrexham begin, with houses on both sides. 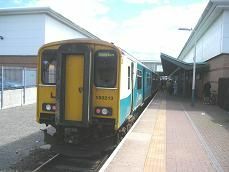 We join the Chester to Shrewsbury line on the left and then come to stop at Wrexham General station, which has two double island platforms and a main third platform, housing the ticket office and waiting room. Our train stops at Platform 4, which is on the extreme right and has a dull green perspex shelter. Most passengers get off here. Wrexham FC's Racecourse ground is next to us on the right. Our track then goes away to the right and into a cutting and then curves sharply to the left, going under the Chester to Wrexham line. We go past a warehouse on the left and under a road bridge and into the single platform Wrexham Central station. It has been rebuilt in recent years with a large perspex frontage, which leads out into a shopping centre, though not many people are waiting on the platform for this train.